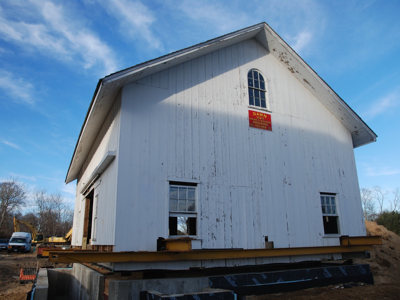 The restoration of the historic barn on the site of the Topping Rose House has begun. It is Bill Campbell’s and Simon Critchell’s vision to restore this original Bridgehampton “drop-girt” barn with it’s unique features as part of their Topping Rose House complex. Timber framers in America used this “drop girt” design approach to simplify and standardize the assembly and raising of framing bents. This technique was used across America through the nineteenth and into the twentieth century. 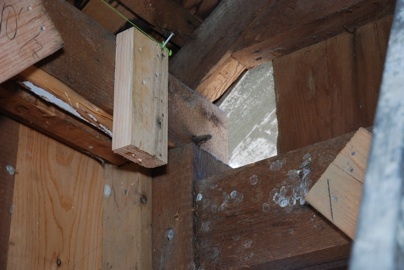 As pictured above, the girt or tie beam is located several inches below the roof plate which is resting on the top of the end post. Another example of the “drop-girt” barn is the Sayre Barn, located at the Southampton Historical Museum on Meeting House Lane in the Village of Southampton. The Topping Rose Barn has been successfully lowered onto its new foundation. The engineering and carpentry design details are now being developed to meet the latest building codes as well as the guidelines established by the Secretary of the Interior’s “Standards for the Treatment of Historic Properties”.